The wax museum is located at the base of the replica of the San Marco tower accessible outside the front of the Hotel/Casino on Las Vegas boulevard (the "Strip"). The hours are 10:00 am to 11:00 pm daily. Admission prices to the wax museum vary: check the website. Las Vegas PennyCollector books, Pennybandz and Pennybandz necklaces are available in the gift shop for $5.00 plus tax ($5.41). Plenty of free parking in the parking garage. The penny machine is located outside by the ticket counter so you do not have to pay admission to the wax museum to access the machine. The penny machine will also accept a $1 or a $5 bill to make change in quarters only. Designs all have Madame Tussauds Las Vegas and cost $1 each. 1. (V) Fremont Street experience. 2. 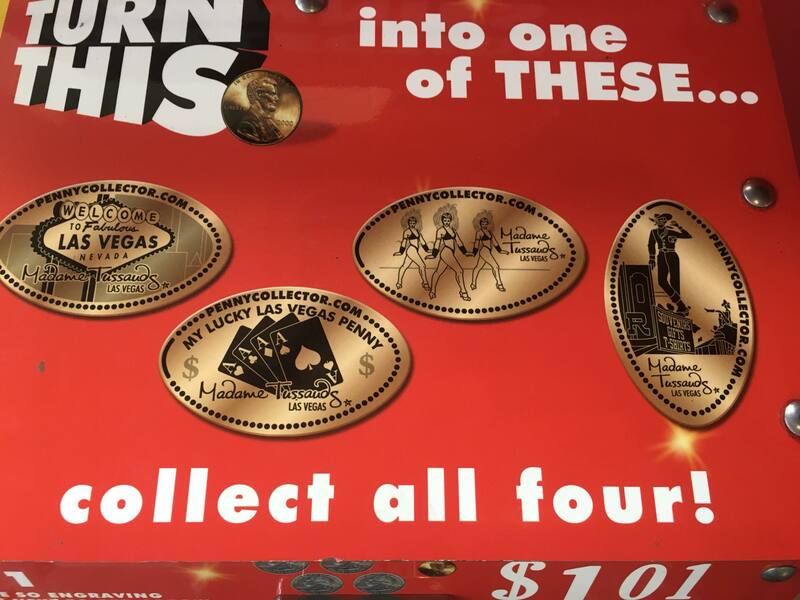 (H) All four Aces and two dollar signs with My Lucky Las Vegas Penny . 3. (H) 3 dancing showgirls. 4. (H) The Welcome to Fabulous Las Vegas Nevada sign.